I hope you have so far enjoyed the lessons. Today, we will review the question form of sentences (Interrogative) in Present Perfect Tense. If you need more help, please go back to Lesson 35. Have I gone to Brazil? 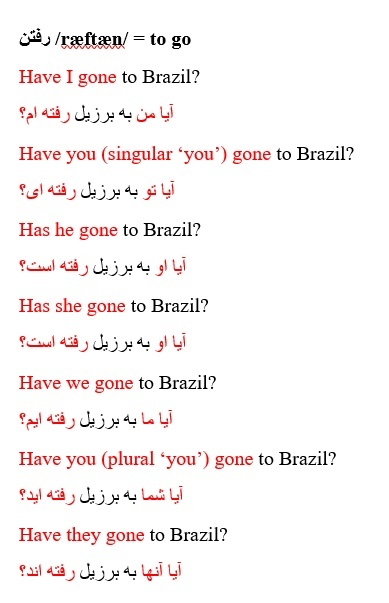 Have you (singular ‘you’) gone to Brazil? Has he gone to Brazil? Has she gone to Brazil? Have we gone to Brazil? Have you (plural ‘you’) gone to Brazil? Have they gone to Brazil? 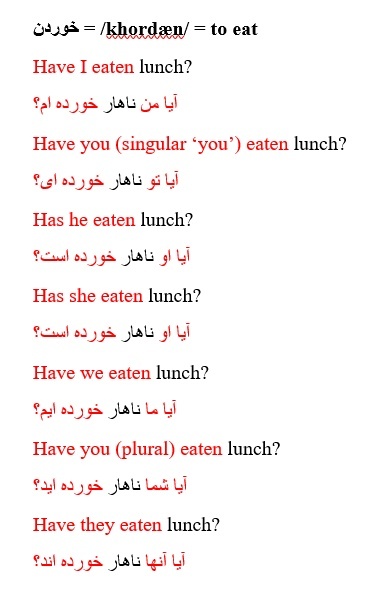 Have you (singular ‘you’) eaten lunch? Have you (plural) eaten lunch? 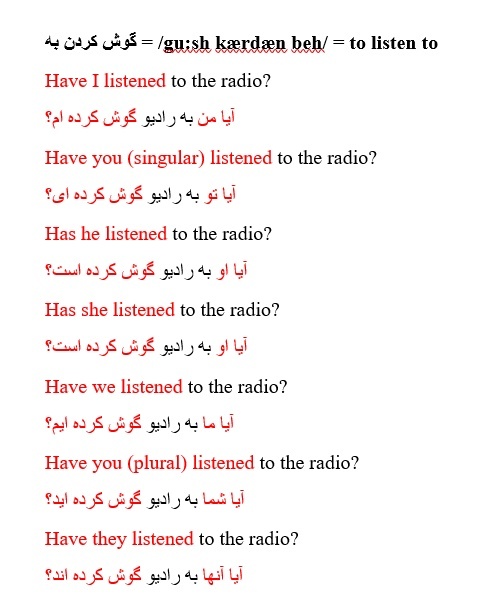 Have I listened to the radio? Have you (singular) listened to the radio? Has he listened to the radio? Has she listened to the radio? Have we listened to the radio? Have you (plural) listened to the radio? Have they listened to the radio? Have I seen your friend? Have you (singular) seen your friend? Has he seen your friend? Has she seen your friend? Have we seen your friend? 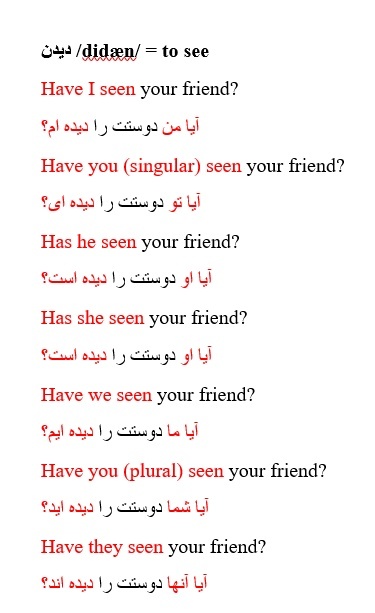 Have you (plural) seen your friend? Have they seen your friend? Have I read a book? Have you (singular) read a book? Has he read a book? Has she read a book? Have we read a book? 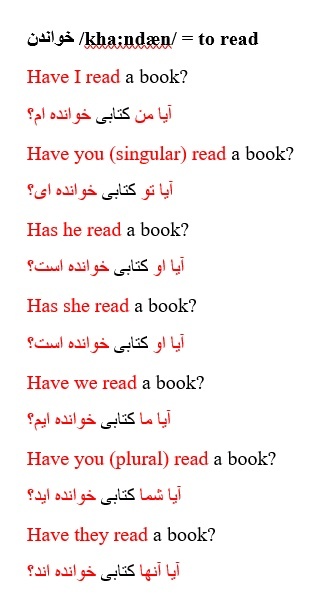 Have you (plural) read a book? Have they read a book? Have I written a letter? Have you (singular) written a letter? Has she written a letter? Have we written a letter? 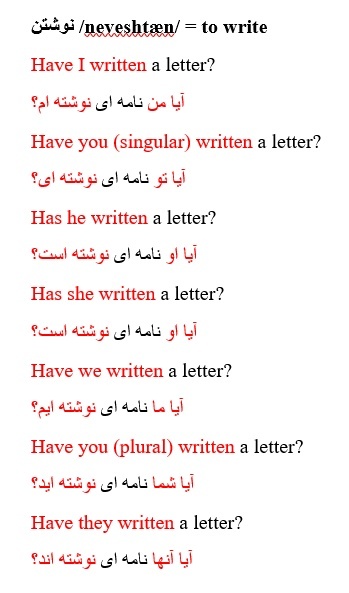 Have you (plural) written a letter? Have they written a letter? Have I cleaned my car? Have you (singular) cleaned my car? Has he cleaned my car? Has she cleaned my car? Have we cleaned my car? 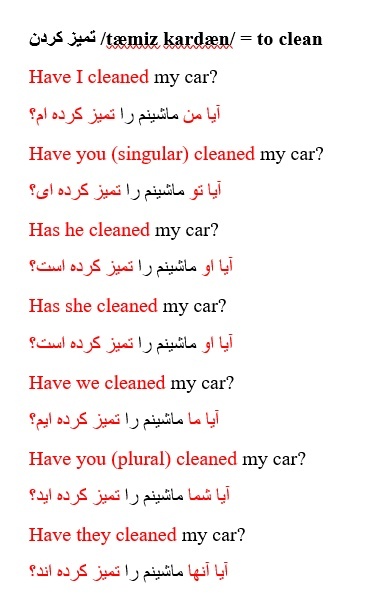 Have you (plural) cleaned my car? Have they cleaned my car? Have I sold my house? Have you (singular) sold my house? Has he sold my house? Has she sold my house? Have we sold my house? 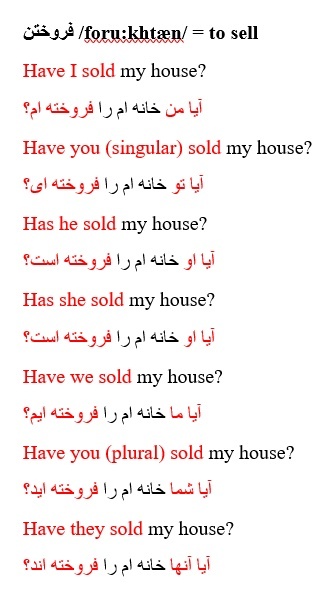 Have you (plural) sold my house? Have they sold my house? Have I washed the dishes? Have you (singular) washed the dishes? Has he washed the dishes? Has she washed the dishes? Have we washed the dishes? 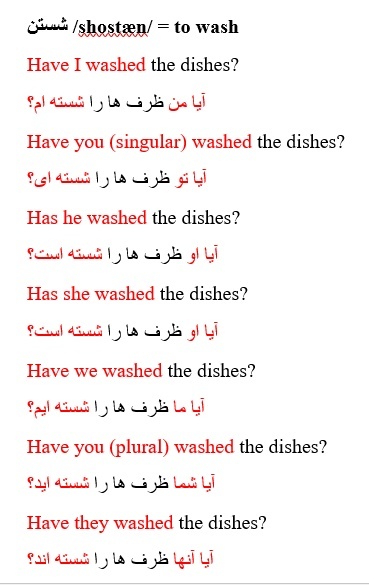 Have you (plural) washed the dishes? Have they washed the dishes? Have I bought a car? Have you (singular) bought a car? Has he bought a car? Has she bought a car? 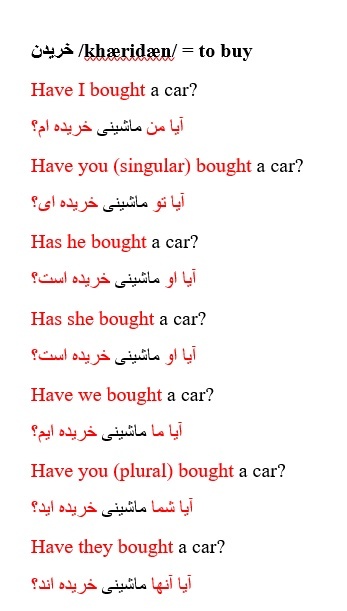 Have we bought a car? Have you (plural) bought a car? Have they bought a car?